Like many cities in China, Hangzhou is undergoing rapid urban change. NBBJ, in collaboration and partnership with CCDI, have designed the Hangzhou Sports Park: A vibrant, pedestrian-centric sports and recreation development located in the midst of Hangzhou’s new urban environment. Shape Olympic main stadium like lotus, dynamic and elegant styling. Designers leveraged advanced parametric scripts and modeling techniques to develop and optimize the exterior shell of the Hangzhou stadium. The steel shell and concrete bowl systems were coordinated and linked for stability and optimized steel use. The end result? We achieved a 67% steel savings over similar arenas like the famed Bird’s Nest, the Beijing National Stadium. The parametric model was used as the basis for cross-disciplinary collaboration with engineers and material. The silver aluminum-magnesium manganese plate and transparent solar panels veneer 28 large and 27 small petals petal, bud-like as this will accommodate the stadium completely wrapped million viewers included, just like a huge lotus flower about to bloom to become eye-catching signs of Qiantang River. It is understood that the main body of the building is no stadium lamps, poles installed in tens of meters away from the building perimeter, light is projected onto a building, this design will be a lot easier to repair later, lighting control box also play a shape and color Invisibility Invisibility, even within the range of vision clinics are also building seamless. In addition, the Olympic Stadium after the lights will truly achieve three modes, tournament mode, festivals mode and power saving mode, to play the role of greater efficiency and energy-saving effect of the stadium, creating a different color of light environment, to achieve “usually solemn , holiday brilliant “visual effects. The site plan is composed of three layers of activity. 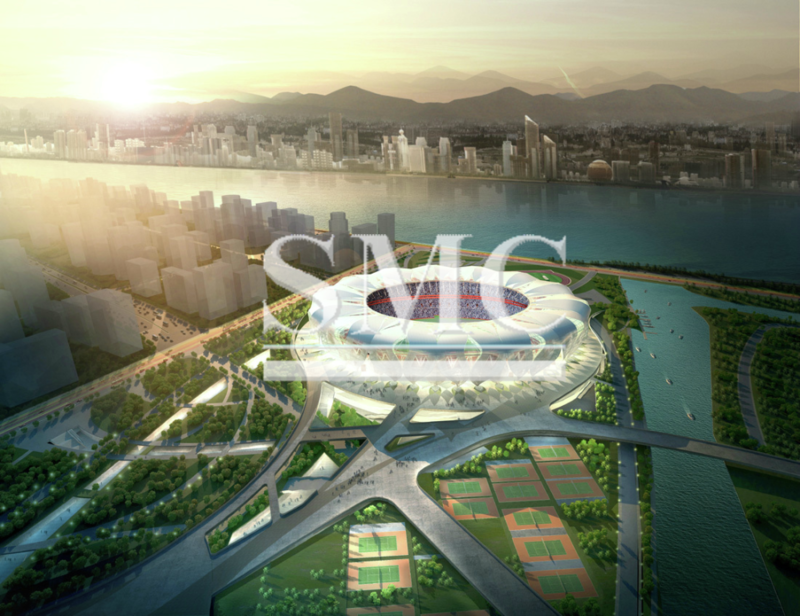 An above-grade platform defines the “sports boulevard,” which links programs such as the main stadium and tennis tournament facilities together. On the ground level, pathways, gardens and plazas form a network of public recreation activities designed for alternative and extreme sports. Sunken spaces and courtyards lead to an extensive below-grade retail pavilion containing boutique stores, restaurants and a multiplex cinema. The main stadium broke ground in 2011 and is slated for completion in 2017.